What does clear to close mortgage mean? A clear to close on mortgage (CTC) is ultimately the finish line in the mortgage process. A clear to close is when the mortgage lender have processed the mortgage loan application. Clear To Close are issued by mortgage underwriters. Prior to CTC, the mortgage underwriter has underwritten the mortgage loan. The mortgage loan applicant has provided all of the conditions requested by the mortgage loan underwriter. All mortgage documents is scrubbed by the mortgage processor before it is submitted to the mortgage underwriter. Any incomplete mortgage docs will be kicked back to the mortgage processor by the underwriter. Incomplete mortgage docs are one of the main reasons for delays in the mortgage process. Final verification of employment has been confirmed. Some mortgage lenders have a quality control department that every mortgage application needs to go though prior to a clear to close can be issued. The quality control department has a quality control mortgage loan underwriter who will review the original mortgage underwriter’ work. This is done to make sure there is no mistakes made and that the mortgage loan can be sold on the secondary market to Fannie Mae or Freddie Mac. Once a clear to close has been issued, the mortgage lender prepares docs. 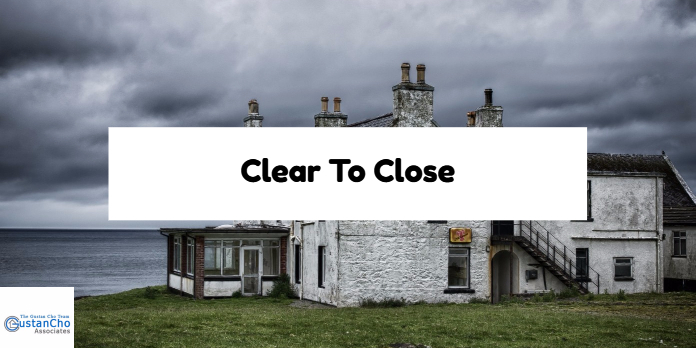 A clear to close means that funds can get wired once final figures are approve. With a CTC, the mortgage loan can close. All docs need to be complete, verified, and make sure that is is insurable on government loans. Conventional Loans are double checked to make sure that the lender can sell it to the secondary market and need to meet Fannie and/or Freddie Mortgage Guidelines. Nothing is different between the processing and underwriting for both mortgage loan programs. What happens after clear to close? When Can Mortgage Close After CTC? Lenders can pull credit up to the date of closing. Lenders may do a final Verification of Employment, Verification of Deposit, or other QC control up to the date of closing. Home Buyers or homeowners needing to qualify for mortgage with a direct lender with no mortgage overlays can contact us at The Gustan Cho Team at Loan Cabin Inc. at 262-716-8151 or text us for faster response. Or email us at gcho@loancabin.com. We are available 7 days a week, evenings, weekends, and holidays. Hi should I start the application process to get detailed feedback on what I need to qualify? If there is an update pending that may impact my score will a new report be pulled that may improve my interest rate? Does this show as 2 inquires? You can call me at 800.900.8569 or go to https://gustancho.com/fast-quote To qualify for a FHA Loan, you need a minimum credit score of 580 credit scores. Open collections and charge offs are fine as long as you have been timely with all of your payments in the past 12 months. Maximum debt to income ratios will be limited to 43% debt to income ratios for borrowers with credit scores of 43% DTI and under. Debt to income ratios can be as high as 56.9% DTI if your credit scores are 620 FICO or higher. Interest rates will depend on your credit scores. The best interest rates for FHA Loans, you would need a 640 FICO credit scores or higher. Please feel free to call me or email me with any questions.